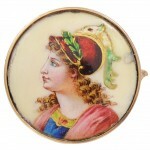 There is remarkable detail in this Victorian era enameled brooch and pendant. The back has an open bale to slide on a chain, or a simple pin closure to wear as a brooch. This is set in 14K yellow gold.